Ever since Colin Chapman came up with the idea of selling a race car chassis as advertising space in 1968, race cars have looked like dense mobile billboards. 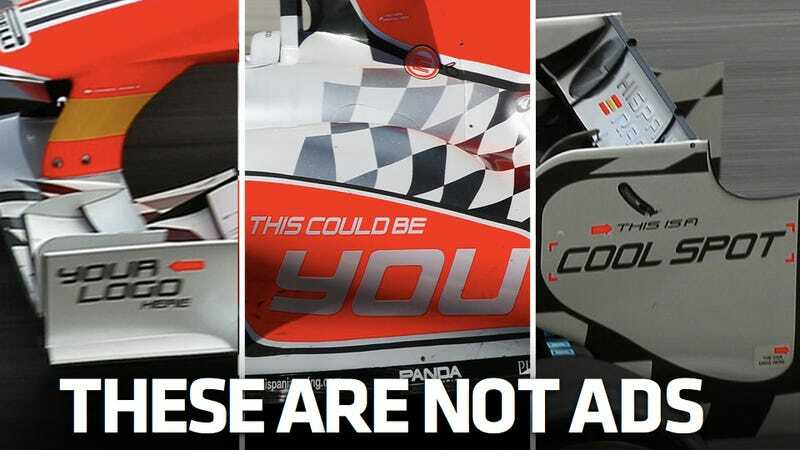 When a modern F1 team cannot sell on-car sponsorship, the result is both amusing and sad. The livery is the work of the German automotive concept designer Daniel Simon, who did the vehicles in Tron: Legacy. The wing in front of the sidepod carries his name. Click through the gallery to see where the fake ads have been placed. The Hispania F111’s advertising dead zones begin with the endplates of the rear wing. One of the larger unbroken surfaces on a modern F1 car, the sidepod is prime advertising space. On the Hispania, this could be you! If you zoom in, you can see the team making a joke of their terrible situation with a sticker saying “Surprise” on the sidepod, and with another that says “Nothing special here” on the airbox. Given the complete lack of performance shown by the team in their 1.25 seasons in F1, the latter is very appropriate. Further evidence of financial misery on the front wing endplate. Joining the “Nothing special here” sticker is another that says “Attention! You are being filmed.” Note that the Indian car company Tata is not a sponsor in the classic sense: they pay Hispania to have the not particularly impressive Narain Karthikeyan drive one of their cars. Apart from placeholder messages, Tata, jokes, and the names of tire supplier Pirelli and engine supplier Cosworth, the only logo-esque motif on the car says Speed. Very avant-garde for a team which has never surrendered its leadership in slowness.